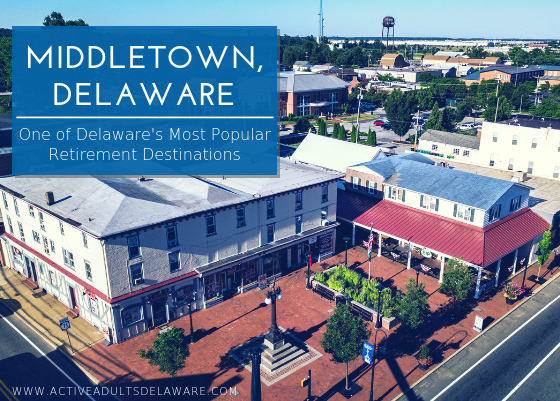 Middletown is becoming one of Delaware’s most popular retirement destinations. No longer do people move to Delaware just to live at the beach. As someone who grew up in New Jersey, many of us in Northern New Jersey made regular treks to the Jersey Shore. A lot of my classmates got their first summer jobs working at the Shore. The same is true of people living in Middletown. It’s a quick trip down Rt. 1 to spend a day, the weekend, or more at the beach. Who is moving to Middletown, Delaware, and why? Convenient location with easy access to the Philadelphia Airport, Amtrak, and other transportation services. For retirees from the Northeast or Mid-Atlantic Regions, this makes it easy to visit family and friends that still live back home. If you have children and grandchildren in New York, New Jersey, Philadelphia, Baltimore or Washington, D.C., Middletown is very centrally located. Middletown enjoys close proximity to cultural centers in Wilmington, Philadelphia and surrounding areas. From museums to performing arts centers, there are year-round cultural activities that are very accessible if you live in Middletown. According to Sperling’s Best Places (no relation! ), the top reasons to live in Middletown are Arts and culture, Educational opportunities and Historic interest. And, as in all of Delaware, there is no Sales Tax and property taxes are lower than in any of the surrounding states in the Mid-Atlantic Region and the Northeast. There is a good selection of both new construction homes and existing homes for sale. Much of the new construction is focused on active adult communities that appeal to Baby Boomers looking to retire to Delaware. Springmill and Spring Arbor are two 55+ active adult communities that occasionally have existing homes for sale in the $300K – $400K price range. When available, they sell quickly because of the location so close to transportation and shopping. Right now, as I write this, there is only one home for sale in each community! The Ponds at Bayberry South is a relatively new 55+ active adult community. Bayberry South has its own exclusive Clubhouse, Fitness Center, pool and amenities as well as access to the amenities in the larger Bayberry Community. Homes in the Ponds at Bayberry South have a Base Model price in the mid to upper $300s. There are both single family floorplans and Villas available as new construction. And then there is the existing Four Seasons at Silver Maple and the brand new Four Seasons at Baymont Farm coming soon. Four Seasons at Silver Maple broke all records in Middletown and in Delaware when it became the fastest selling community in Delaware at the time. We expect the same at the new Baymont Farm. We will be able to get you details in February and begin writing contracts in March. The first residents will be moving in this October! We will be hosting a “Sneak Peak” in February, so let us know if the new Four Seasons at Baymont Farm sounds like the perfect community for you. If you would like to learn more about Retiring to Middletown, please contact us! You can schedule a consultation with one of our Active Adults Realty agents to learn more about your retirement plans and help you find the perfect community for you. Wondering what the rest of Delaware has to offer? Request your copy of our Relocation Guide here! I forwarded today’s Active Adults to a friend I met in the grocery store today – he is interested in Delaware and will be headed to the Delmarva area in a few weeks. Thanks for keeping me on the distribution list. Thanks so much, Joe. Have him call ahead if possible so we will make sure to have someone available to help him. Believe it or not, we are busy even in January and February!